Today is the release day for two of my critique partners, Terry Spear and Vonda Sinclair. Kissing the Highlander features five novellas from Terry, Vonda, Vickie Roberts, Eliza Knight, and Willa Blair. Peep this beautiful cover and read the blurbs below. Lady Sorcha Barclay fled her brother-in-law's castle because of his unwanted advances. An awe-inspiring circle of standing stones captures her attention and she captures the attention of the laird who owns the land. Laird Ronan Daziel takes Sorcha to his castle to protect her and give her a home. Before long, he wants much more. He's duty-bound to take a wife whose clan wishes an alliance with his. So why does he long to have something more? Everyone loves the lass as much as he does. But he has pledged his loyalty to his clan. Taking Sorcha to wife could lead to battle on several fronts. How can he wed another when she stole his heart from the first moment he laid eyes on her near the ancient standing stones on his lands? Riding home after two years away, Gavan MacNabb encounters a lass and her deerhound in a moonlit circle of standing stones. Little does he know the garland of bluebells she weaves and the spell she sings will change the course of his life. Marsali Murray doesn’t really believe the old wives’ tale that making a chain of bluebells by the standing stones under a waxing moon will bring true love, but she’s desperate to try anything to escape the boring, everlasting sameness of her life. Gavan has already seen much of the world denied to Marsali. He’s ready to settle down. She is eager to spread her wings. Can they find what they need with each other? Since the deaths of her parents, Ceana Gunn has lived in the shadow of her uncle and his family. She wants nothing more than to see her clan the way it was when her father was still laird. But her uncle has other ideas. 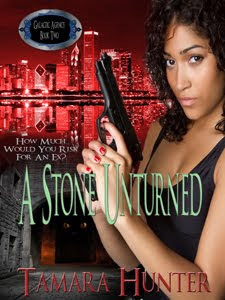 Ceana soon discovers that the only refuge to be found is in the last place she expects—the arms of her enemy. Luthais MacKay wants to be left alone. His only interest is training his prized hawks. He certainly doesn’t have time to listen to the petty squabbling of his clan when his father travels to Edinburgh and leaves him in charge. But when Luthais discovers a mysterious woman on his lands, he’s determined to unravel her secrets…one layer at a time.